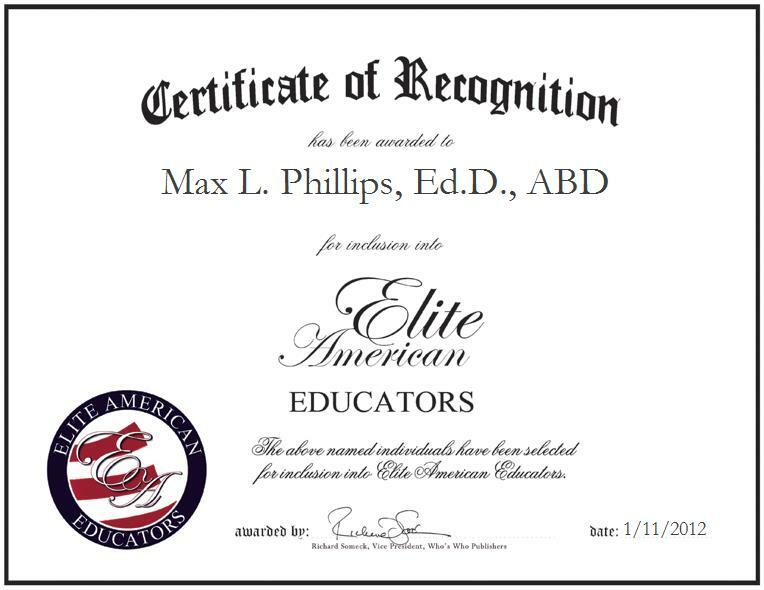 FORT THOMAS, AZ, January 11, 2012, Max L. Phillips, Ed.D., ABD, School Improvement Director for Fort Thomas Unified Schools, has been recognized by Elite American Educators for dedication, achievements, and leadership in education. With more than 41 years of professional experience in the sphere of academia, Mr. Phillips is currently responsible for helping students with behavioral issues, monitoring the district’s grants, and improving the overall school performance. He conducts meetings with teachers, administrative staff and school leadership teams, and strives to build an educational infrastructure that will enable newly established programs to be carried forward successfully. The highlight of his career was leading an Arizona elementary school of 300 students, 21 teachers, seven teachers’ aides and a principal from a failing status to a performing status in one semester. He continued this progress throughout the following school year and achieved “performing plus” status. Mr. Phillips was instrumental in turning around two schools, a small high school and an elementary school in Arizona. Both had lost their direction and he helped create changes in the students as well as removing some of the staff. The most important part to him was, following both behavioral and academic changes within the school, he retained a positive relationship with many of those who had to leave for this turnaround to be accomplished. He has received a number of commendations and awards throughout the course of his career, which has spanned more than four decades, and he continues to make every effort to make valuable contributions to the field of education. He received national recognition from the Real Justice System in 1999, he was recognized as a two-time coach for the Champion Runner-Up Girls’ Track Team of the Division 2-A in the State of Arizona in 1995 and 1996, and he was nominated as the 1997 Teacher of the Year in the State of Arizona. Mr. Phillips is a doctoral candidate at Northern Arizona University, where he has completed all the requirements except the dissertation. Moreover, he is a respected former classroom teacher and athletic coach. After retiring twice, he returned to the Fort Thomas Unified Schools, where he is now working to carry forward the school improvements he recently facilitated. Mr. Phillips, who taught in the classroom for 27 years and was a Bishop in the Mormon Church for five years, also does statewide public speaking. He has 37 grandchildren.